Goldeen had ambitions too, you know. 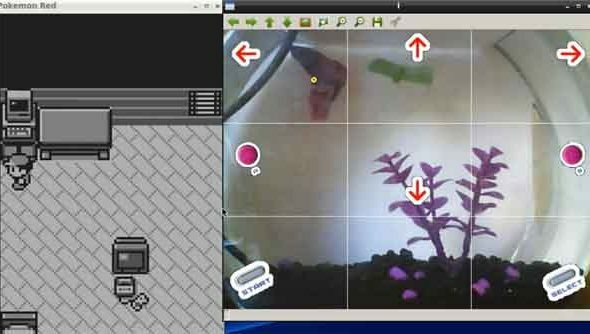 Using an emulator set-up much like the one that powers Twitch Plays Pokemon, a pet owner has volunteered his fish to play Pokemon Red for the entertainment of a Twitch audience. The fish, named Grayson Hopper, has been playing for over 132 hours – with plenty of breaks for sleep and contemplation. In that time he has acquired his first Pokemon, a charmander named AAAABBK, and defeated his first opponent – another hopeful wielding a Squirtle. The channel’s hosts have mapped Game Boy keys to portions of Grayson’s bowl, like a vertical dance mat. At the time of writing, Grayson has just saved his game. He doesn’t know he’s on the path to becoming a Pokemon master, naturally – but that knowledge hasn’t appeared to help viewers of rival channel Twitch Plays Pokemon make faster progress. The stream isn’t quite 24 hours, due to practical constraints. “Unfortunately, we don’t have a dedicated light for Grayson at night as he lives in a tiny dorm room and we would rather not sleep with the light on,” write Hopper’s owners. The channel’s FAQ answers just one question: is the fish dead? Grayson was unavailable for comment on Twitch’s new constraints on copyrighted music.